Mangrove ecosystems in Sri Lanka are increasingly under threat from development projects, especially aquaculture. An economic assessment is presented for a relatively large (42 ha) shrimp culture development proposed for the Rekawa Lagoon system in the south of Sri Lanka, which involved an extended cost–benefit analysis of the proposal and an estimate of the “total economic value” (TEV) of a mangrove ecosystem. The analysis revealed that the internal benefits of developing the shrimp farm are higher than the internal costs in the ratio of 1.5:1. However, when the wider environmental impacts are more comprehensively evaluated, the external benefits are much lower than the external costs in a ratio that ranges between 1:6 and 1:11. In areas like Rekawa, where agriculture and fisheries are widely practiced at subsistence levels, shrimp aquaculture developments have disproportionately large impacts on traditional livelihoods and social welfare. 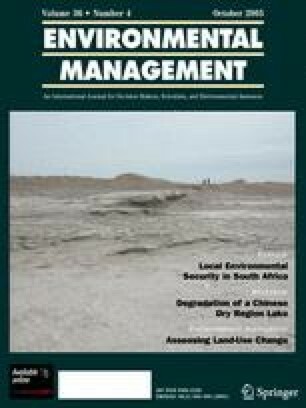 Thus, although the analysis retains considerable uncertainties, more explicit costing of the environmental services provided by mangrove ecosystems demonstrates that low intensity, but sustainable, harvesting has far greater long-term value to local stakeholders and the wider community than large shrimp aquaculture developments. This work was completed while MG completed a PhD at Lancaster University, UK. TEAMS Consultants are acknowledged for providing studentship funds and providing logistical support for fieldwork in Sri Lanka. The valuable and constructive comments made by two external reviewers are also gratefully acknowledged.